As you’ve probably noticed, last week I went to Krabi in Thailand for 4 days. Lucky for me it was sponsored by Air Asia and arranged by Nuffnang. Krabi is pretty close to Phuket if you are familiar with that place, the difference is it’s a lot less commercialised – which in my opinion makes it a MUCH better place to go to. It’s still pretty quiet, in Krabi center the shops close at 9.30pm and even in the ‘tourist’ area Ao Nang everything is pretty much closed by midnight. 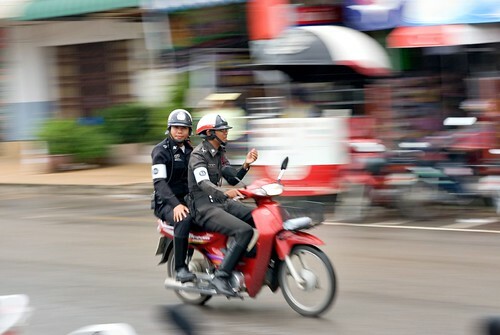 It’s a fairly small city with about 20,000 people and it’s the provincial capital of Krabi Province, the province itself has a population of around 340,000 people. We left from KLIA LCCT at 10am on Tuesday morning. 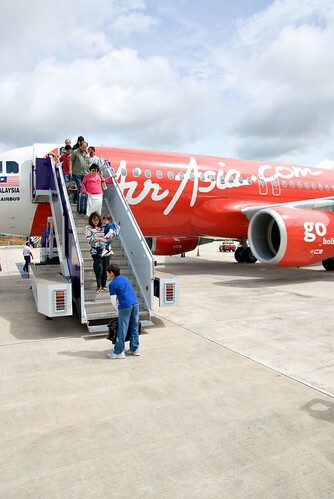 Air Asia has a new facility at LCCT where if you are traveling light you can check in via the bright red Kiosk Check-In and avoid all the queues which is very useful. 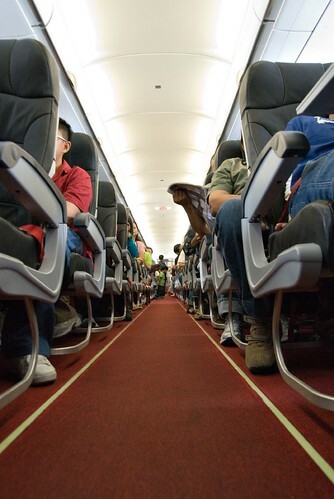 It’s only for those with hand luggage though, but you can save some time if you don’t have bags to check in. The Kiosk will scan the barcode from your online ticket print-out and check you in. 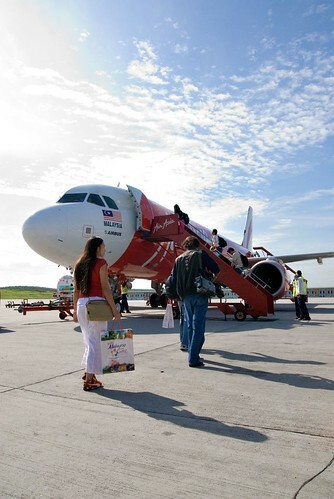 This was the inaugural flight for KL-Krabi! Flights to Krabi start from RM49.90. It was full too, it looks like it’s going to be a popular destination. The plane landed about 6 minutes ahead of schedule! The weather was a bit grey when we arrived, was hoping for blue skies! But we were warmly greeting by Thai Air Asia and some representatives from the Krabi Tourism Board. We were then picked up by the lovely Mr See Tho from See Tho Holidays – based in Krabi. We stopped to take some pictures of a temple high on a hill, but the light was terrible so I didn’t really get anything decent. 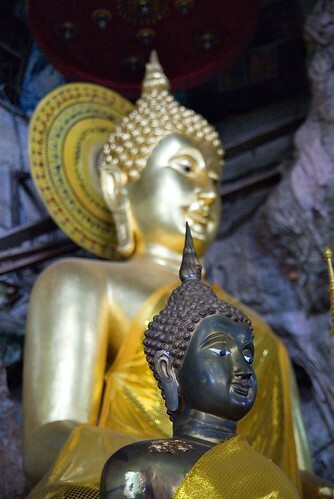 You could actually climb the 1,272 steps to the top and see the Buddha’s footprint…but we all declined. 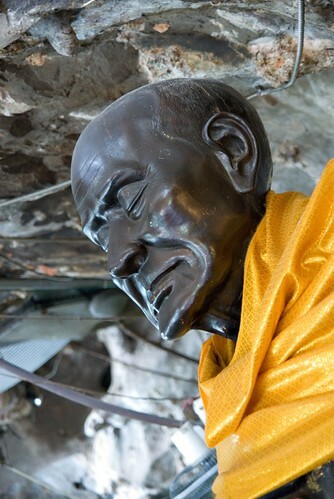 After that we went to the famous Tiger Cave (Wat Tham Sua). 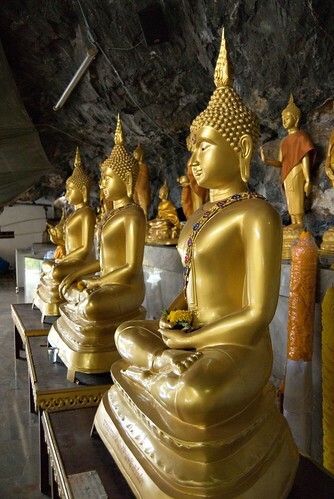 Wat Tham Seua/Sua (Tiger Cave Temple) 5 km from Krabi Town is a small temple built inside a long shallow limestone cave, surrounded by natural forest. The temple, one of the south’s most famous meditation centres, takes its name from a stone formation nearby which resembles a tiger’s claw. Today, about 250 monks and nuns live in the temple compound. 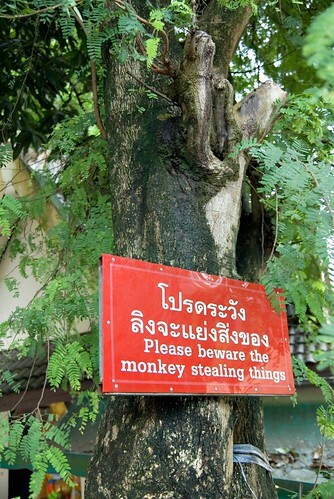 There was a lot of monkeys there, not tigers..there was even a sign warning you to be careful of your stuff. There’s a lot of strange buddhist relics and figures inside the temple. I liked this one as it looked so peaceful. 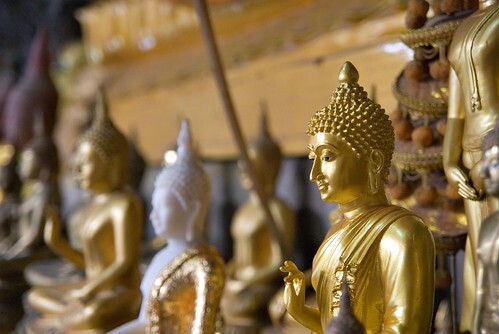 There are big buddhas, small buddhas, gold ones, brown ones, black ones – ALL kinds. There was a Pagoda outside too with a Kuan Yin inside, but the light wasn’t good enough to take pictures. 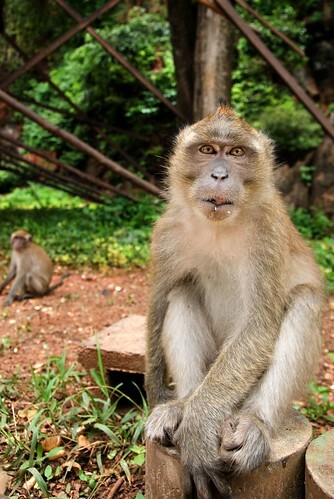 Loads of monkeys around too, just like our beloved Batu Caves! The Fossil (Gastropod) Beach is near by, but due to the weather we didn’t make it there. After that we headed for lunch at a local restaurant, scenic place in some man made paddy fields, too hungry to take any decent pictures though…hadn’t had much breakfast. Straight after the quick lunch stop we headed into Krabi center to see the fruit and food market, to check out some local culture and see how the Krabi people keep it real. 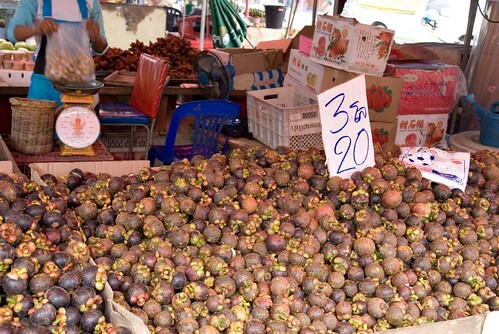 I can’t believe how cheap fruit is there, we ate fruit non-stop virtually all of the time and it was delicious – check this out 20 Baht for 3 Kilos of mangosteen (YES that IS RM2). Most fruits were about the same price, Bananas were 15 Baht (RM1.50) per KG and they were really good. The market was quite interesting, similar to our own pasar but different in some ways. 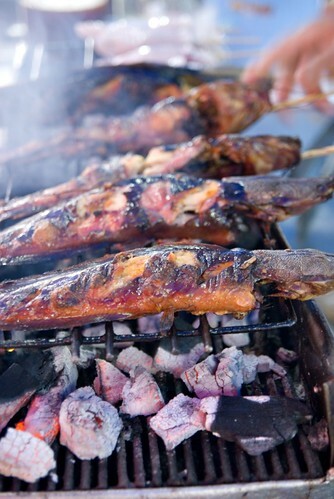 There were all kinds of interesting looking grilled things and food. They have stuff like our Nasi Campur/Kandar/Chaap Fan too. 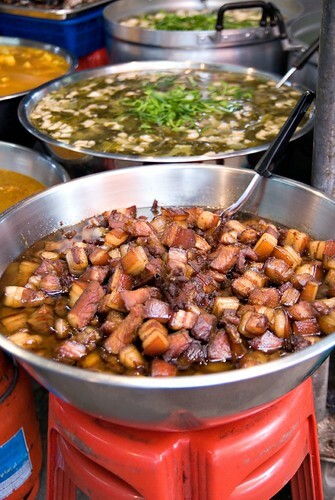 The main difference I guess is the HUGE pots of pork, no really I mean…HUGE. It was raining a bit so we didn’t stay that long, we hung around a bit whilst NTV7 did their thing. The weather was miserable after that, it pissed it down! 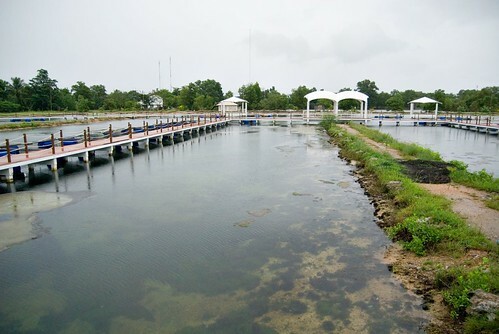 We headed to the fish farm anyway – which is apparently a project by the King of Thailand to repair the marine ecosystem somewhat. They breed quite a variety of sea fish there, then release them back into the ocean. 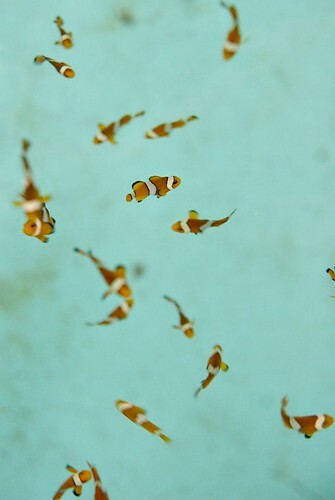 They had all kinds of fish from big to small, clown fish, puffer fish, moray eels, black tip reef sharks – all kinds. After that, finally back to the hotel! When it Krabi it’s most common to stay around the Ao Nang area, there is a variety of accommodation there ranging from guest-houses to 5 star resort and boutique style hotels. We stayed at Krabi La Playa which was nice! It was ever so cute the way they folded the towels into little elephants! They were arranged in a different way each day too. The room was fairly normal, nice and clean and spacious. There was a bit of a view, but due to the weather – nothing much to see. I’m planning for a trip to Phuket during the Hari Raya long weekend… Since you just came back from Krabi… Just wondered is Krabi much more better than Phuket? 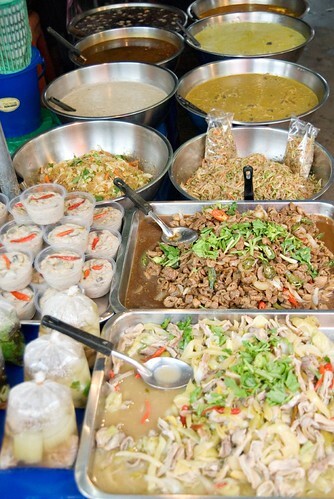 TZ: I’d say Krabi is better, unless you want more shopping/markets then Bangkok is better than Phuket. Krabi has nicer beaches, is closer to Phi Phi, has good small islands nearby, snorkeling, kayaking, elephant jungle trekking and more!